The Giant LEGO Brick Sculptures exhibit is included with General Admission to Memphis Zoo. 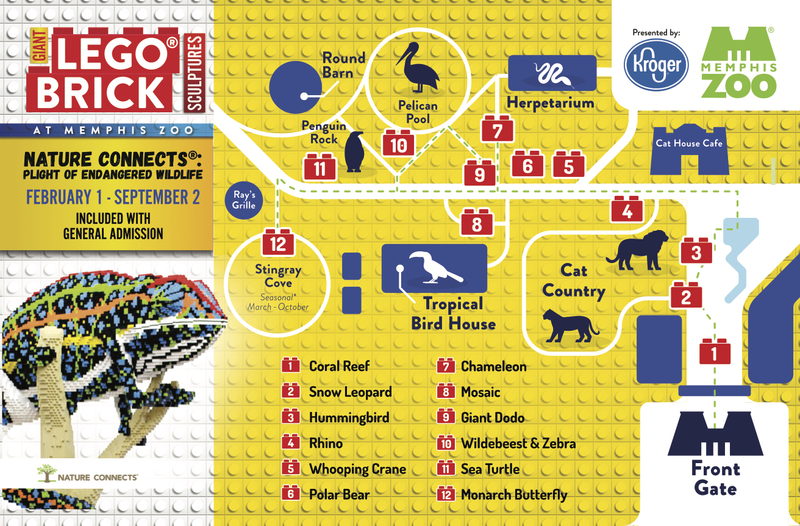 Visit Memphis Zoo and see Nature Connects LEGO Brick Sculptures by award-winning artist and "professional kid," Sean Kenney. The sculptures are bigger than ever and focused on the plight of endangered wildlife, including the largest sculpture built to date by Sean Kenney, an adult mama polar bear and her cubs, weighing 625 pounds. These all-new sculptures are a "must-see" event ... and it's all included with your general admission ticket! The LEGO name is made from the first two letters of the Danish words "LEG GODT," meaning "play well." LEGO bricks were first sold in 1958. A LEGO brick from 1958 will still fit with a current LEGO brick. There are 915 million ways to combine six (6) LEGO bricks. Sean Kenney has more than five (5) million LEGO pieces. The largest sculpture Sean has made weighs 625 pounds. The sculpture is of an adult polar bear and cubs that will be on display at Memphis Zoo in 2019. Sean Kenney has more than four (4) tons of LEGO bricks in his Brooklyn studio. Just as LEGO pieces interconnect, everything in nature is interconnected in a delicate balance. Insects and plants have important relationships; different species of animals have special relationships with each other; animals have connections with their families, just like we do. And of course, people have a connection with nature, whether you're trimming a bonsai tree or planting a garden, or anything else: you are a part of nature. Sean Kenney is a renowned, award-winning artist and "professional kid" who uses LEGO pieces to design and create contemporary sculpture for high-profile clients, major corporations, and venues around the globe for over 10 years. He has authored eight (8) best-selling inspirational children's books, and his award-winning exhibit, Nature Connects, has been breaking attendance records around the world since 2012.